This is our custom-built 5 pin XLRM to 5 pin XLRF DMX-512 120ohm digital lighting control cable with 1 pair wire (only 3 pins wired). Construction is Neutrik XLRs with our own EHS PRO-DMX1 cable. Neutrik connectors are some of the best connectors around, with no screws to fall out after years of abuse. PRO-DMX1 wire we had specially made to our spec as an upgrade to Horizon DMX1. It has a true 120ohm impedance and a better shield with both 100% foil and braided shield. It is designed for greater performance and durability. It is very flexible, durable, medium-weight cable, with 24awg twisted pair core and a dual shield with braid and 100% coverage foil. 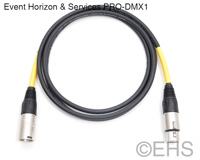 Event Horizon & Services PRO-DMX1 cable (single pair shielded wire, only 3 pins will be wired). Identify Length, Ex: Red=10ft, White=15ft, Blue=20ft, (you can pick your own code). Photo 1 shows 6' cable with yellow shrink labels. Photo 2 shows the two ends with nickel connectors and yellow shrink labels.